This piece originally appeared 12/19/14. What really distinguishes this game is its storytelling. Super Metroid is cinematic in its approach, using a combination of textual, audio, and visual cues to tell its story. And the game’s opening sequence—part non-interactive cutscene, part player-controlled exploration—is a mini-masterpiece unto itself. It establishes sympathy for Samus, sets the overall tone of the game, and tells us everything, plotwise, that we need to know, all in under eight minutes. Again, the black background, as Samus, concealed in black shadow, types the game’s backstory. This is humanizing; you hear tapping keyboard keys as the letters process across the screen in green font. There is no way to speed up the typing or skip past it, and thus it feels ‘real,’ like a person is typing these lines rather than a computer. From this log, you learn a bit about Samus’ personality—just enough to fill in the rest. She has a forthright, practical attitude about her work. She has a moral conscience, beyond the ‘soldier-for-hire’ concerns of a bounty hunter. But most importantly, Samus humanizes the Metroid hatchling, comparing its actions to those of a “confused child.” This extra layer of mother/child subtext makes Samus’ fight personal: it’s a mother figure rescuing her kidnapped child. Samus is later juxtaposed with an abusive mother figure, who exploits her ‘child’ for her own end. The Mother Brain is a terrifying perversion of femininity and maternity. For longtime fans, this was a visual treat, and it places Super Metroid in its proper context not as a reboot, but as a continuation of an epic story. At the time, it was rare for a dramatic plotline to sustain itself across three games on three different systems. The overlaying music, composed by Kenji Yamamoto and Minako Himano, seems to rise and fall with Samus’ narrative. It’s haunting when she relates a struggle and triumphant when she overcomes it. Early video game composers, lacking the technology to record songs with ‘real’ instruments, used synthesizers to convincingly imitate them. You know that you’re listening to a series of bleeps and bloops, but you can’t help but hear timpani drums. A hi-hat cymbal. A horn section. And a chanting, atmospheric choir. But then, the music abruptly stops. CERES STATION IS UNDER ATTACK!! You race over to the space station, neither stopping for supplies nor waiting to power up your suit. It’s one of those awkward screenwriting tropes, in which the needs of the gameplay conflict with the narrative logic. How does Samus, who spent the previous two games powering up, start her new mission at square one, with nothing to show for her prior efforts? I suppose the emergency distress signal is as good of an excuse as any. There are certainly worse, more awkward excuses in other Metroid games, such as when Samus has to ask her superior, Adam, for permission to activate her powers in Other M.
So you board the Ceres station, and you control Samus for the first time. Everything is bathed in a dark blue light. The power is down, and the temperature is frigid. This is not good. But you push on. You make your way down a series of stairs and into the main room of the research facility. Chaos greets you. The scientists? Dead and sprawled across the floor. The central canister that held the Metroid hatchling? Shattered. And the Metroid hatchling itself? Nowhere to be seen. At this point, you haven’t run into a single enemy, but it’s clear that something massive and destructive laid waste to the facility. Throughout the game, there are empty areas just like this one, which once supported intelligent life. But now they have been reclaimed by forces beyond human control, and you are left with the remains. Your imagination runs wild. What caused this? Who once lived here? It’s a prevalent, simmering dread that is only relieved, albeit briefly, during the area boss fights. You head down another hallway and meet Ridley, a gigantic, fire-breathing space dragon who has his talons wrapped around the hatchling. Finally, someone to inflict your aggressions upon! You begin fighting, but despair slowly builds in the pit of your stomach. You are going to die, and there’s no way to save yourself. You have zero Energy Tanks, no Missiles, and no special abilities—just a basic arm cannon that shoots tiny balls of energy. Ridley, on the other hand, is just too powerful and too massive. It almost seems like he’s toying with you, as he whips his tail and breathes gigantic balls of fire. Your health steadily ticks down. Hopeless resignation sets in. But then, just when your health reaches critical levels, Ridley swoops away with the hatchling, directly towards the camera in an iconic, terrifying closeup. The first time I played this sequence, I experienced a mixture of relief and horror : relief that I had come so close to death and been spared, and horror that I wasn’t even close to defeating my enemy. I later learned that the fight is unbeatable; Ridley will always damage you until you’re close to death, and then fly off instead of killing you. But the first time you attempt this sequence, you don’t know that the game is orchestrating a near death and purposely manipulating your survival instincts. 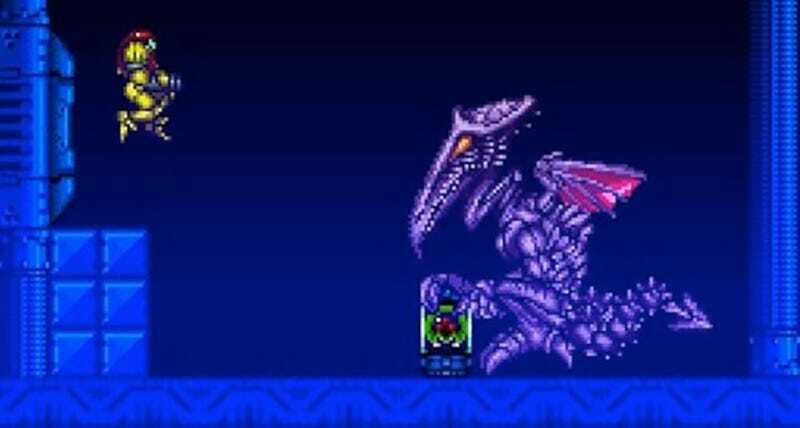 The stakes are high, and so you experience, albeit on a smaller level, the same feelings that an overmatched Samus would have in this scenario.There’s the initial adrenaline rush, the hopelessness of being outgunned, and the mixed emotions of relief and anger when Ridley flies away unscathed. Even if you’re a Metroid expert and manage to shoot Ridley 100 times, he won’t die. He’ll drop the hatchling, but he’ll still scoop it back up before making his dramatic escape. Of course, that’s when the auto-destruct countdown starts. You’re nearly dead from the Ridley fight, and now you have to sprint out of the station in 60 seconds flat. Every room escalates the urgency to total panic. First, you run back into the lab. It’s shaking, and the equipment looks hot, but that’s a manageable level of chaos. Then you run into the stairwell, and steam starts shooting out at you. If it hits you, it knocks you back and stresses you out even more. It doesn’t actually hurt you, but in the moment you’re probably not thinking logically. The slightest hit will eat up your precious time, and you still have so far to go. Then you run into the main room, and the ceiling starts collapsing. Again, it’s all pre-programmed mayhem. No matter how quickly or slowly you complete the sequence, the ceiling only starts collapsing when you reach this room. But in the moment, it creates a fantastic illusion that the ship is falling apart quickly, while you barely keep up. And then, the pièce de résistance. You reach the elevator shaft, and the entire ship tilts over. You’re climbing a series of platforms while your perspective is tilted at a 60 degree angle, and it ruins your hand eye coordination. You miss the simplest jumps, and that just makes you more and more desperate. Finally, you reach the exit at the top of the shaft, and you fly away from the Ceres Station as it explodes. This is all prologue—you haven’t even landed on Zebes yet, which is where 99% of the game takes place. But this stressful opening sequence is necessary to the whole game, because it rattles your confidence and comfort. You’re focused almost entirely upon your own survival, and so many things are out of your control. By the time you’re exploring Zebes, you are no longer playing as Samus—you are Samus, and you’re on red alert for anything out of the ordinary. I remember spending the remainder of the game in an anxious, observant state, wondering if the next room held something even more dangerous. The quiet moments are sometimes the worst, because you’re waiting for the other shoe to drop. You suspect (with good reason!) that something horrible will catch you off guard. The floor could break and send you tumbling into a spike pit. An earthquake could send a sea of lava to swallow you up. One minute you’re shooting space slugs, and the next minute a bird statue comes to life and attacks you. One moment you’re exploring a new cave, and the next moment a mutant crocodile monster seals you in and smushes you into a spiked wall. Zebes is a sprawling, fantastical world. The sheer variety of levels is both stunning and immersive: the wild vegetation of Brinstar, the deep sea beauty of Maridia, the decayed bowels of the Wrecked Ship. The enemies add to this. With the exception of the space pirates and the area bosses, neither the enemies nor the environmental hazards in Super Metroid are soldiers in a Mother Brain army. They’re simply inhabitants of their respective ecosystems—insects flying around Brinstar, slugs crawling on the Norfair rocks, gigantic sea worms in Maridia. Their attacks are instinctual, not deliberate. And this makes the ‘real enemies,’ such as the Mother Brain henchmen like Kraid and Ridley who attack you with deliberation, threatening by comparison. All of this makes Super Metroid a special game. Super Metroid continues to captivate us, and exists in that rarefied category of artistic transcendence, because of its storytelling. The opening scenes showcase a mastery of ‘show, don’t tell.’ Every minor detail has a purpose: to drive our actions, to advance the plot with few words, and to emotionally invest us in what happens, to whom it happens, and why. Kevin is an AP English teacher and freelance writer from Queens, NY. His focus is on video games, American pop culture, and Asian American issues. He wrote a weekly column for Complex called “Throwback Thursdays,” which spotlighted video games and trends from previous console generations. Kevin has also been published in VIBE, Salon, PopMatters, and Racialicious, and he will soon be published in Joystiq. You can email him at kevinjameswong@gmail.com, and follow him on Twitter at https://twitter.com/kevinjameswong.